At the June meeting of the California Water Commission, Tracy Petitt-Polhemus, Supervising Engineer with DWR’s SWP Operations Office, gave this presentation. She provided an overview of the State Water Project facilities, project purposes, key agreements and requirements under which the State Water Project must operate, Delta operations, how the water allocation to our contractors is determined, and the challenges they face in operating the State Water Project. Tracy Petitt-Polhemus began with a map showing the various water projects throughout the state of California. 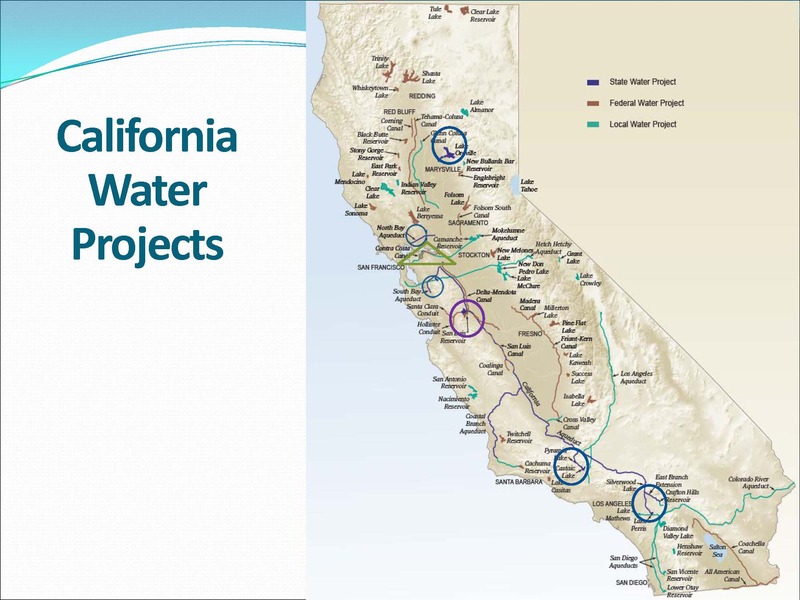 The federal water projects, such as the Central Valley Project, are shown in brown; local projects, such as the Hetch Hetchy and the Los Angeles Aqueduct, are shown in green. The facilities of the State Water Project are shown in blue; the major facilities are circled. The State Water Project is the largest state-built and operated multi-purpose water and power system in the US. 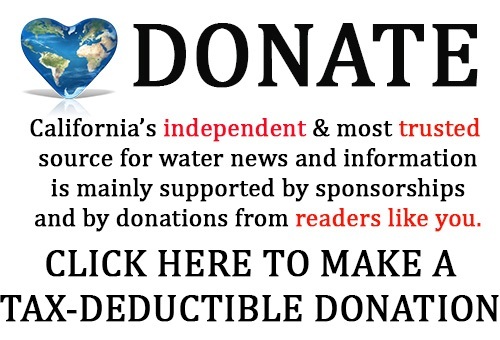 There’s about 20-25 million residents in the state of California that take all or a portion of their water from the State Water Project. The facilities of the State Water Project begin with the three upper Feather River reservoirs: Frenchman, Antelope Lake, and Lake Davis. The Feather River then flows into Lake Oroville, the tallest dam in the US at about 770 feet. From there, the Feather River flows down into the Delta. The North Bay Aqueduct supplies state water contractors in Benicia, Vallejo, and Solano County. 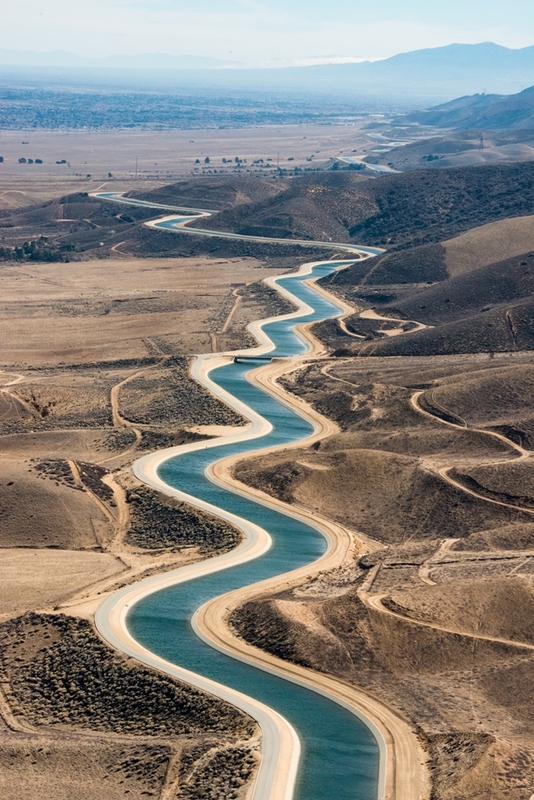 The South Bay Aqueduct supplies state water contractors such as Santa Clara and Alameda. 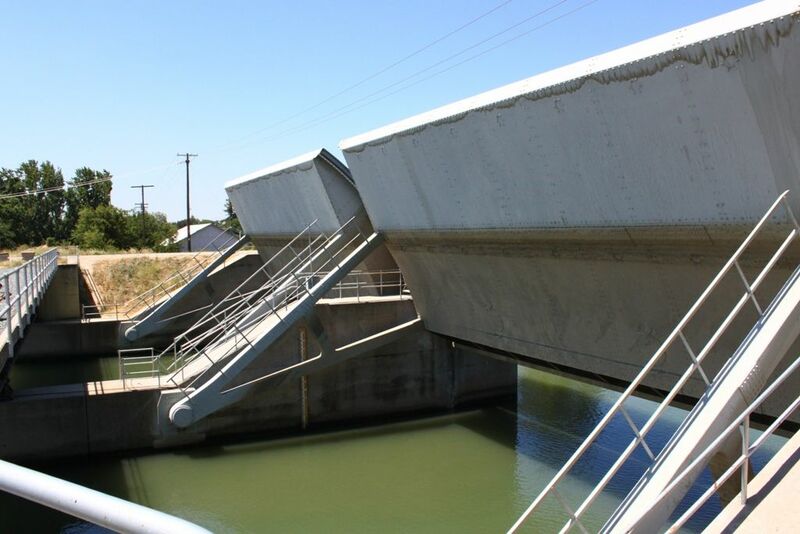 The California Aqueduct begins at the Banks Pumping Plant in the South Delta. 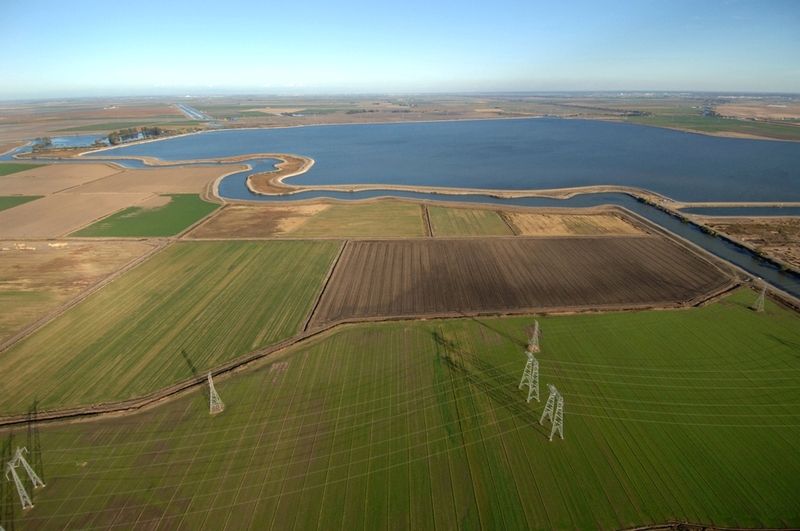 South of the Delta, the San Luis Reservoir and O’Niell Forebay are part of a joint-use project shared with facilities shared with the Central Valley Project. The Coastal Branch supplies the Central Coast areas of San Luis Obispo County and Santa Barbara. The coastal branch terminates at the Vandenburg AFB. At the base of the Tehachapis, the Edmonston Pumping Plant pushes the water over the Tehachapis and into Southern California where it birfurcates into the East Branch and the West Branch. The East Branch terminates at Lake Perris and the West Branch terminates at Castaic Lake. There are about 700 miles of canal and pipeline; 4 pumping/generating plants, 20 pumping plants, 5 hydroelectric plants, and 23 dams. The State Project is the third largest generator of power in the State of California. Municipal and industrial uses account for 70% of the State Water Project water; 30% is for agriculture. Metropolitan is the largest urban contractor at 2MAF; Kern County Water Agency is the largest agricultural contractor at about 1 MAF. Water from the State Water Project irrigates about 750,000 acres of crops. 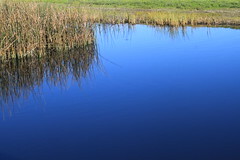 The primary purposes of the State Water Project are water supply and flood control. Secondary purposes are fish and wildlife enhancement and mitigation, Delta water quality and flow, recreation, and power generation. There are several key agreements and requirements under which the State Water Project operates. 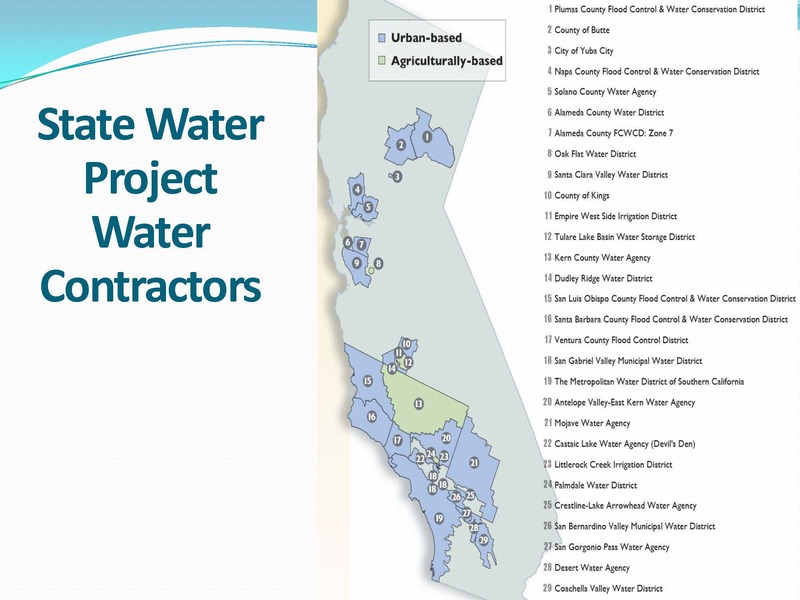 Some are individual obligations of the State Water Project; some of them are joint obligations with the Central Valley Project. The US Army Corps of Engineers oversees flood control and navigation. Three reservoirs within the State Water Project have received monies for flood protection from the US Army Corps: Lake Oroville, Del Valley Dam, and Los Banos. Clifton Court has a permit for navigation. The Federal Energy Regulatory Commission issues hydropower licenses for the Lake Oroville facilities and our southern facilities. There is a 1983 agreement with the California Department of Fish and Wildlife agreement for both flow and temperature requirements in the Feather River. 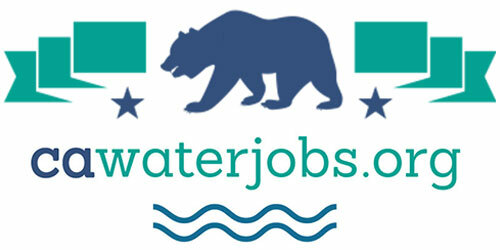 There are also State Water Resources Control Board permit and conditions: Water Rights Decision 1641 has water quality and outflow standards that both the Central Valley Project and the State Water Project have to meet; there is also a water quality certification for Lake Oroville as part of the hydropower relicensing. There are Endangered Species Act and the California Endangered Species Act requirements which are met jointly with the Central Valley Project. 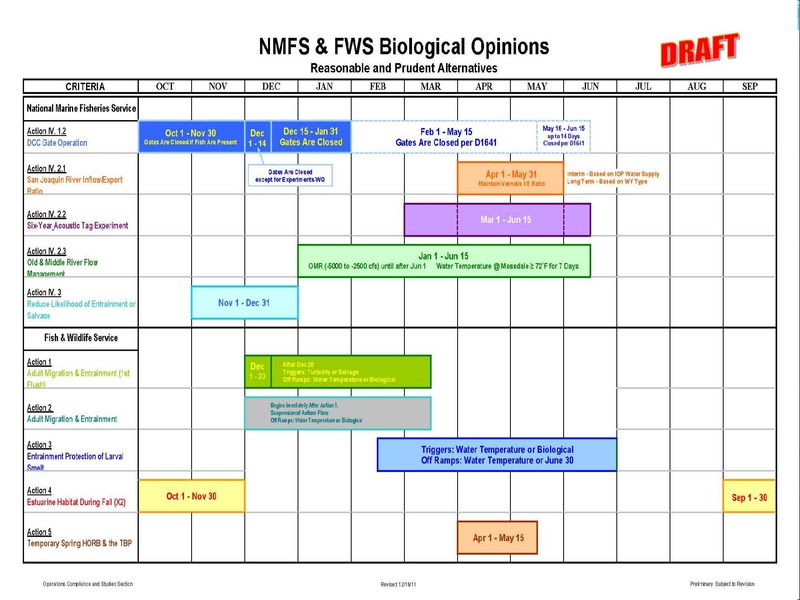 The US FWS issued a biological opinion for Delta smelt that came into effect in December of 2008; the National Marine Fisheries Service issued a biological opinion that came into effect in June of 2009. The California Department of Fish and Wildlife issued a permit for longfin smelt which came into effect in 2009. The Coordinated Operations Agreement is a 1986 agreement that defines the methodology of how both projects will meet in-basin demands and how they will share the responsibilities. The San Luis Joint Use Facilities Operating Agreement specifies how the joint use facilities will be operated, such as the scheduling of power and water at San Luis and at the O’Niell Forebay. The standards are tied to what water year type it is: Wet, above normal, below normal, dry, and critical dry. Outflow can have a range depending on the year types. “You’ll have more water under a wet year that you need to provide than in a dry year,” she noted. 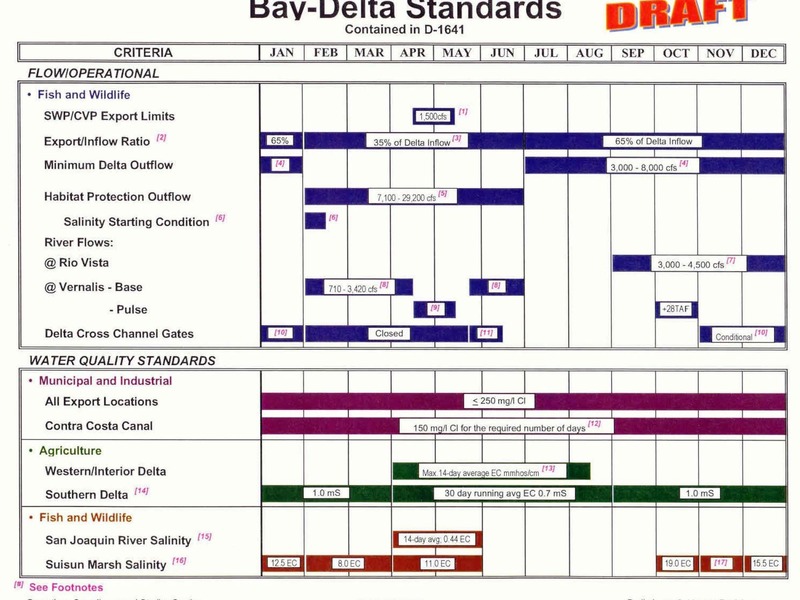 The water year type affects not only flow but also how the Delta cross channel gates are operated. There are water quality standards for things such as chlorides that must be met throughout the year. “We are seeing more of adaptive management approach in managing the fish,” she said. “How we manage to meet those criteria is we look at real-time conditions such as flow and temperature, or if we see any salvage or observed fish at the export facilities, as well as the fish distribution.” She noted that they have been looking at the genetics of the fish are salvaged. Export reductions: The export pumps at the Jones Pumping Plant (Central Valley Project) are single-speed, so once they are on, they are harder to adjust versus the Banks Pumping Plant (State Water Project), she noted. 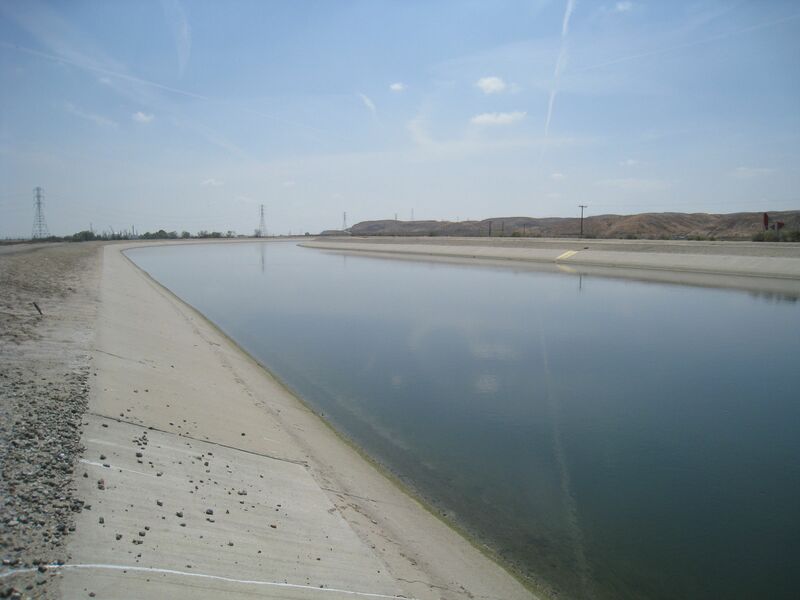 The units at Banks Pumping Plant are variable speed; the state facilities also include Clifton Court Forebay, which gives them more flexibility in operations than the Central Valley Project. Ms. Petitt-Polhemus noted that they can also use a combination of the three tools. Much of the Delta is below sea level, so there are levees that protect it. 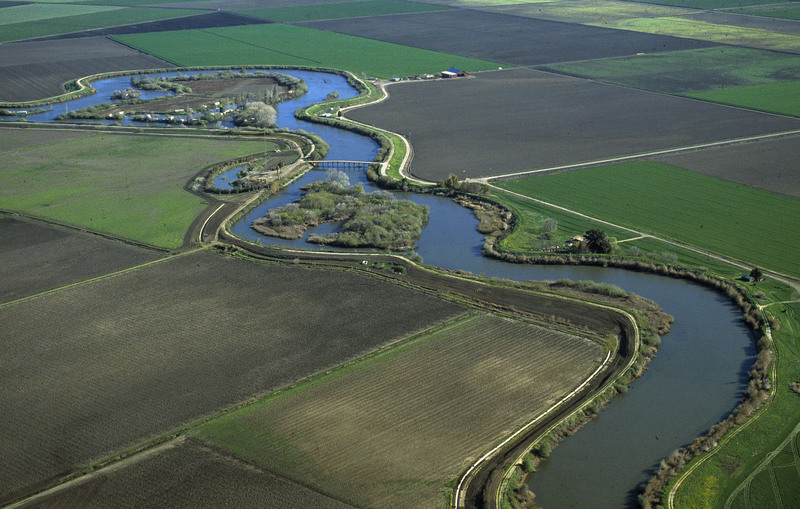 There are over 1100 miles of waterways within the Delta. There is also a network of gauges that monitor water quality and flow. 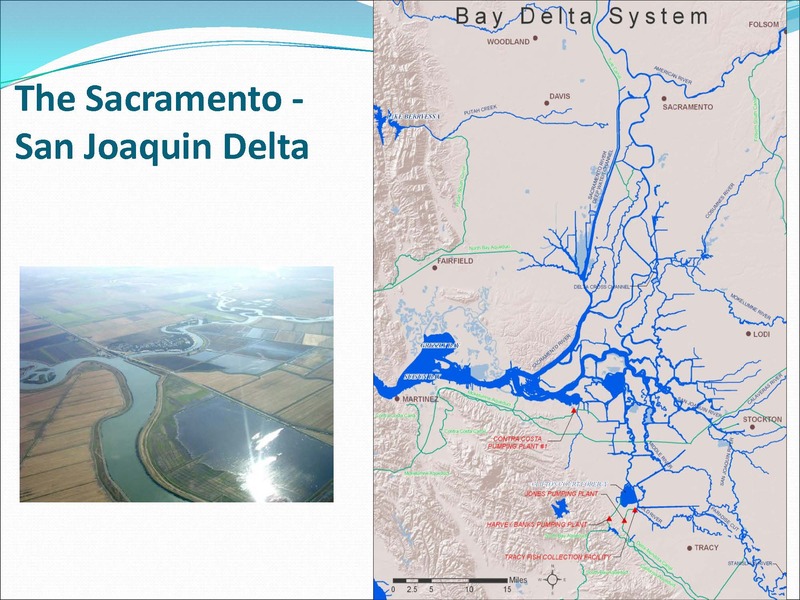 The Sacramento River flows in from the north; three-quarters of the water in an average year is from the reservoirs; in drier years, up to 90% of the inflow coming into the Delta is from reservoir releases, Ms. Petitt-Polhemus said. The San Joaquin flows in from the southeast; there are also east side streams which come into the Delta. The Delta is a tidally-influenced estuary, and Ms. Petitt-Polhemus pointed out that there are huge tidal surges that come in that are in multiple hundreds of thousands of cfs coming in and sloshing back and forth at least twice a day; project operations are only several thousands of cfs, as compared to the hundred thousands of cfs from the tides. There are also are four barriers installed in the Delta that help with operations. In the spring and in the fall, the Head of Old River barrier is a fish barrier that helps with the outmigration of the San Joaquin salmonids; there are three agricultural barriers that help with water levels and water quality. These barriers in conjunction with export operations have an effect on the hydrodynamics, water quality, and the fish in the Delta. Ms. Petitt-Polhemus then explained the procedure for determining water for the State Water Project contractors. The State Water Project is contracted to deliver about 4.2 million acre-feet; the allocation is stated as a percentage of the Table A amount that the contractors receive. Water demand is also considered: every October, they receive a plan of what kind of delivery would contractors would like under various allocations, a 30, a 50, a 60, and 100%., and those are included in our studies. There are also competing project objectives, such as flood control and water supply. “If you release too much, if you release too little, how do you balance the two?” she noted. For more information on the State Water Project, click here. 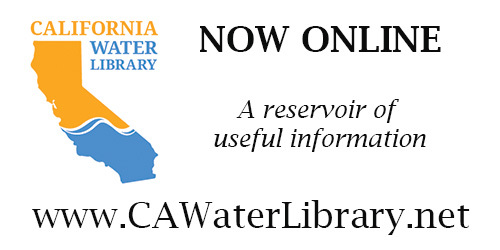 For more information on all of California’s different water infrastructure, click here. Click here for the full agenda, meeting materials, and webcast for the June California Water Commission meeting.